Michael C. Hall as Dexter Morgan in “Waiting to Exhale”, episode 2.02 of Dexter. Although the network had been running original programming since the early 1980s, Showtime’s status as an original TV network was catapulted by the debut of Dexter in 2006. The show began as a loose adaptation of Jeff Lindsay’s novels about Dexter Morgan, a vigilante serial killer who only targets other killers. Dexter’s abilities as a killer are assisted by his position as a forensic blood spatter analyst for the [fictional] Miami-Metro Police Department where his now-deceased father Harry had been a legendary detective (though not without his own demons) and his half-sister is currently trying to live up to Harry’s reputation. At a young age, Dexter’s urge to kill had been recognized by foster father-but-actually-biological-father-also Harry. Rather than allow Dexter to follow the likes of Ted Bundy and Richard Ramirez, Harry developed a code for Dexter to follow where he must only kill people who are undoubtedly murderers themselves and ensure his own personal safety by disposing of the evidence. Typically, Dexter was able to stay under the radar by only killing murderers who were untouched by the law, but his investigations began to overlap with the Miami-Metro PD’s investigations as the series continued. The first two seasons – as is the case for most Showtime shows – are often regarded as the best with a returning spike in quality for the fourth and fifth seasons. Following that, the show began to decline into a slower death than Dexter’s victims are given. There were still enjoyable moments, and the shocking finale of the sixth season (after the all-time “Hello, whore” low) showing promise for a new series dynamic. It fell back into formulaic territory, though, with Showtime’s apparent rules that Dexter must both evade capture and always be the white knight of the hour standing strong. 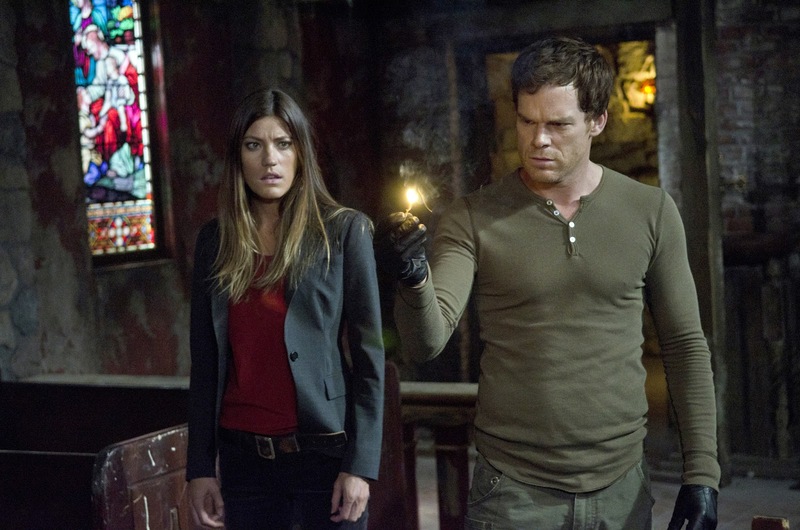 The show also expanded its focus beyond the most interesting central characters of Dexter and his half-sis Debra (played by Jennifer Carpenter) and non-issues such as a trilby-clad detective opening a Cuban restaurant and one of the sleazier detectives’ dating misadventures became far too prominent. Many long-time fans of the show suffered through the wishful ups and disappointingly expected lows of the final seasons before hoping that some goodwill could be returned by the finale. Without giving much away, I think it’s safe to say that this didn’t happen. After the stunning conclusion of Breaking Bad, Dexter showed what happens when a series falls too far from its early strokes of brilliance and under domain of the network rather than an original auteur. 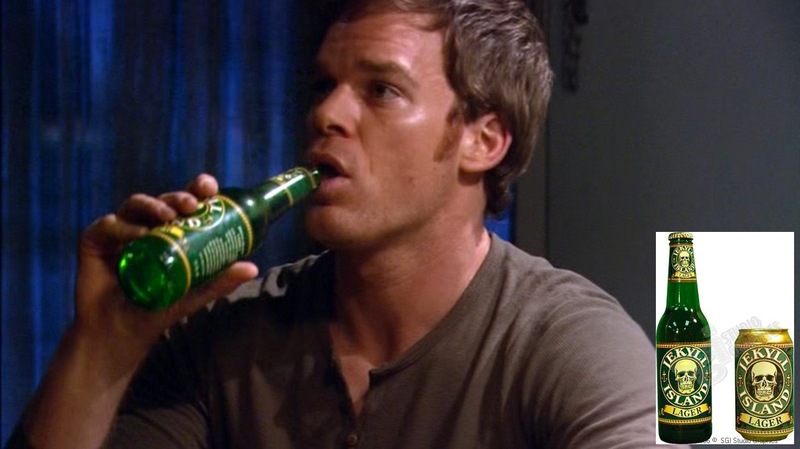 Still, whether the show was in top form or not, Michael C. Hall was well-deserving of all praise and awards thrown his way as the titular Dexter. After the fourth season, a very quality outing which pitches Hall against John Lithgow of all people, Hall won a Golden Globe for Best Actor in a TV Drama. Due to the show’s darkly comic emphasis on blood and new take on slasher horror, I’ve been wanting to post about Dexter on Halloween since the blog was started. Unfortunately, I’ve only had the first two seasons at my screencapping disposal so that will be where the bulk of my information comes from. There were subtle changes to Dexter’s ritualistic “kill outfit” as the series went out, but you should get the gist of it from here. Ritualistic like many serial killers, Dexter wears the same outfit for all of his kills with few exceptions. His look is very military-inspired, evoking the idea that he approaches each kill like a secret mission. It’s a relatively weather-friendly outfit that allows him to hide in the shadows without appearing too sinister and allows him to inconspicuously carry the many tools of his deadly trade. 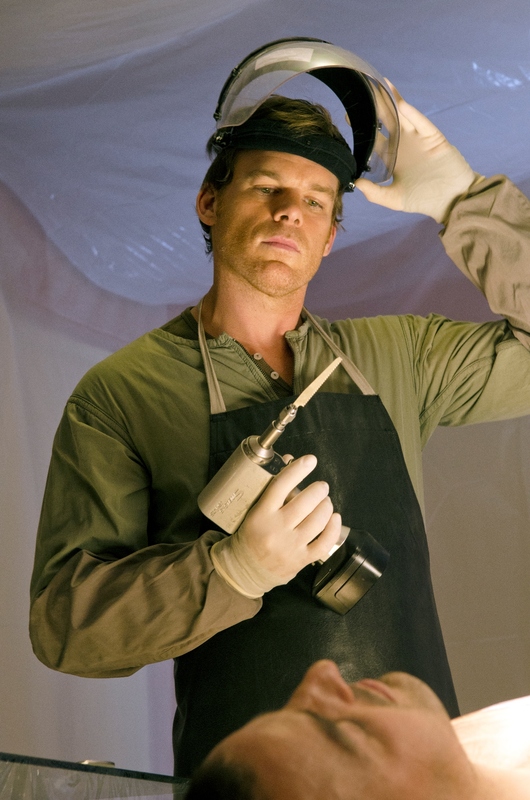 Showtime auctioned off a version of Dexter’s outfit which they refer to as his “Stalk Outfit” for obvious diplomatic reasons, although it could be argued that the term “stalk outfit” is more accurate since he dons an apron and smock for the actual killing. Showtime’s “Stalk Outfit” sold for $4,350 after receiving 88 bids. 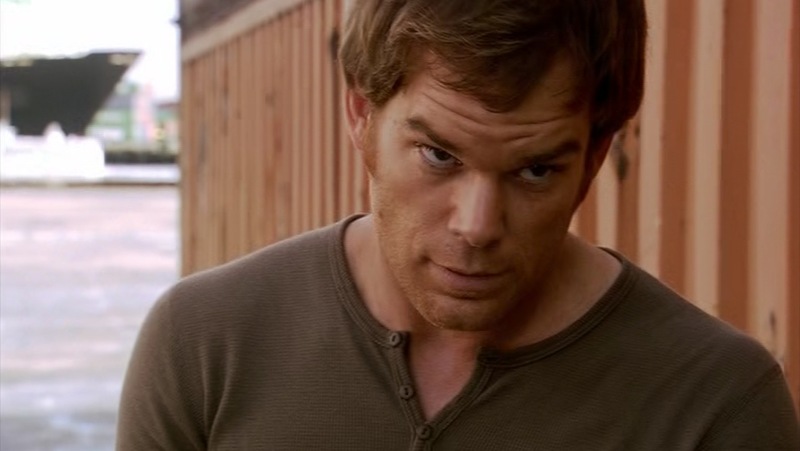 Dexter’s shirt, the most consistent part of his kill outfit, is a brown lightweight thermal henley with a four-button collar. The specific shirt used on the series was American Apparel’s “Baby Thermal” constructed of 55% cotton and 45% polyester. 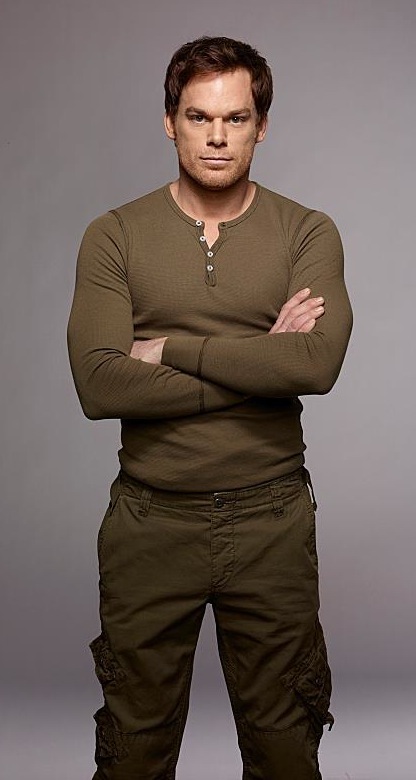 With the exception of the pilot and a few episodes at the end of the first season, this has been the exact same shirt in a color described by American Apparel as “army” with elasticized sleeves, a long, rounded hem, and four white plastic buttons. Dexter almost always leaves the top two buttons open and the bottom two fastened. I have the exact same shirt, which I purchased at my college campus’ American Apparel store a few years before I had seen the show. It was entertaining to see Dexter’s kill outfit consisting of a shirt that was folded in my dresser just a few feet away when I started watching it. You can still order this shirt from American Apparel’s online store as item t457. Showtime also licensed a few copycat versions, including a branded version on their site. In the final three episodes of the first season, Dexter wears a similar shirt but with flat brown plastic buttons instead of the white seen in every other episode. It is the same color, construction, and style as the other shirt so it’s likely also American Apparel, but all of their current “Baby Thermal” collection uses only the white buttons. The thermal is the same, but the buttons are not. Some shirts in later episodes also appear to be a darker brown, more chocolate than army. In a shockingly forgone chance at creativeness, American Apparel simply calls this color “brown”. 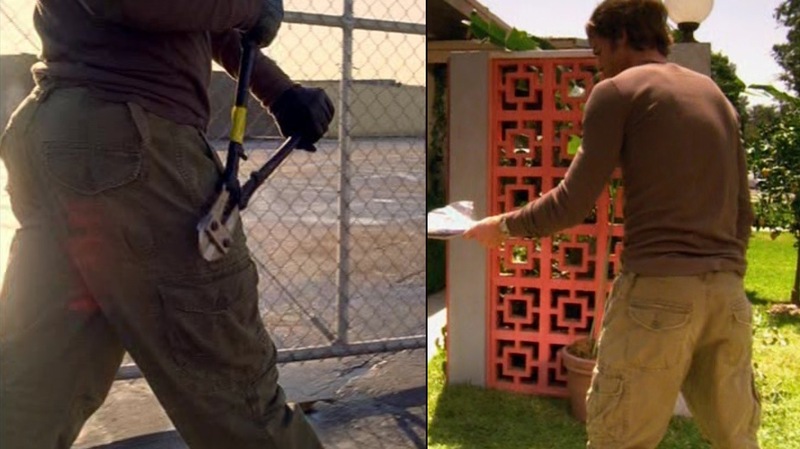 Dexter’s pants went through a little more variety during the series, but almost all of his kill outfit pants were military-style cargo pants, much like parachuter’s fatigues. It must be stressed that they are not “parachute pants”, which are a sartorial travesty and would go better undiscussed. Dexter’s cargo pants have slanted side pockets; a smaller coin pocket with a silver button appeared in later seasons’ pants also. The cargo pockets, further down the thigh, close with buttoned flaps. The additional pockets help Dex carry around his tools such as his M99 syringe and knife unobtrusively as well as his personal accessories like cell phone, keys, police laminate, and wallet. Unlike most parachuter fatigue pants, Dexter’s only have six rather than eight pockets, seemingly eliminating the ankle pockets. In addition to the front slash pockets and the thigh cargo pockets, Dexter’s pants also have large rear pockets with buttoned flaps. Dex with a prepped victim. The pants have both belt loops and side-adjusters for a secure fit despite the bagginess through the legs. There are four single belt loops and a single “V”-shaped double belt loop in the rear center waistband. The side-adjusters consist of a single 2″ non-contrasting strap fitted through a brass metal buckle on each side of the waist. A khaki version of Dex’s pants, best exhibiting the side adjusters and various pockets. The front of the pants have an exposed single button waist closure and a reinforced covered button fly. Due to their long, baggy fit, the pants tend to drape over his boots. Dexter’s pants are various earth tones, usually olive drab, but he has also worn variations in khaki and brown. Like the shirt, the pants are typically also a cotton and polyester blend. Dexter’s pant colors ranged from more tactical olive drab to a warmer, more casual khaki. According to a representative from the show’s wardrobe department, the pants are the now-discontinued “Raff Elwood”style from the Dutch manufacturer G-Star RAW, again in “army” coloring. Fans have deduced that the G-Star RAW pants were used in the third and fourth seasons while Lucky Brand provided the cargo pants for seasons one and two. Although Dexter’s weren’t military-issued, I’m sure any pair of drab parachute pants from a surplus store would do just as well, if not better. 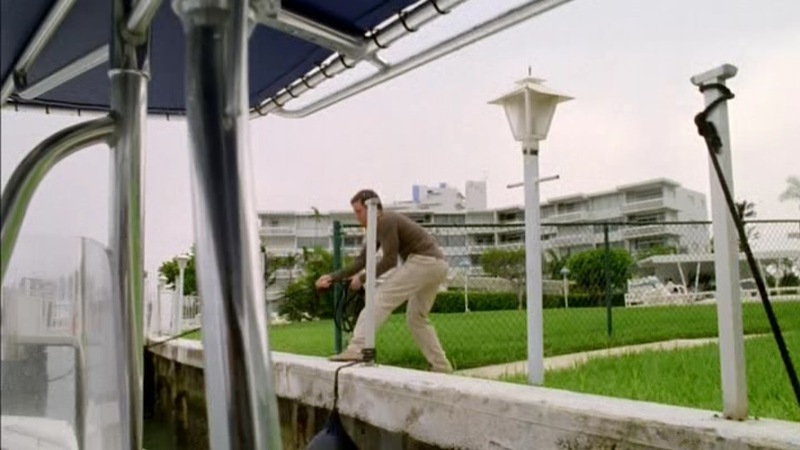 A strange continuity error in “Seeing Red” – the same episode that kicked off the brown-button shirts of the first season – shows Dexter wearing a pair of regular khaki chinos and sand-colored loafers with his kill shirt. To the best of my recollection, this was unexplained and he was wearing his regular drab parachuter cargo pants and boots in the next scene. A preppier version of the kill outfit. Dexter’s correct boots are a pair of Diesel “Cassidy” cow leather boots in “mocha bisque” with a cap toe and ten sets of lace eyelets up the front. The boots have heavy dark brown rubber lug soles and are still available from Diesel’s website for $295. Though his shirts and pants may have changed slightly from season to season, Dexter always wore his Diesel Cassidy boots for his investigations and subsequent kills. Towards the end of the second season in “There’s Something About Harry”, Miami Metro’s suspicious Sgt. Doakes tracks Dexter to a temporary hideout in the Everglades. During a fight, Doakes shoots Dexter in the leg with his 9 mm Beretta. 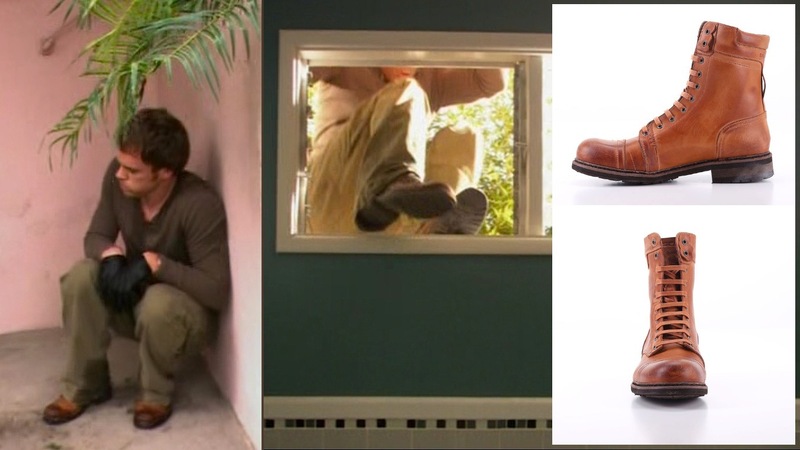 After securing Doakes, Dexter removes his pants and boots, revealing a pair of light brown cotton socks. Considering Dexter’s penchant for brown, most of Miami-Metro PD thought he moonlighted as a UPS driver rather than a serial killer. This scene also shows Dexter’s preferred choice of underwear, a pair of dark brown striped boxer shorts. The stripes alternate between black stripes and a thinner, more subtle red stripe. Although this outfit was mostly established in the show’s second episode, the pilot episode – and early promotional photography – feature Dexter in a slightly different outfit. This kill outfit consists of a darker brown henley with black buttons and light green exposed seams on the shoulders and wrists. Dexter wore black fatigue pants instead of the more traditional military-issued olive drab, and his boots were well-polished brown leather laced boots with five eyelets. Dex was still wearing a different, exposed-seam shirt by the second episode but it had white buttons to match the later shirts. The image used in the promotional still features a different outfit than the one seen on the show. The most traditionally murder-associated facet of Dexter’s kill outfit are his sinister black unlined leather gloves. The exact gloves worn by Dexter are Damascus D302 UltraThin™ Cabretta Police Gloves, which can be picked up here for less than $50. This shot of Dexter’s Damascus gloves also shows off other details like the shirt’s curved hem and the reinforced button fly of the cargo pants. Dexter also continues wearing his usual watch, a steel Waltham Self-Winding 25 Jewel on an expanding bracelet. According to the show, Dexter inherited the watch from Harry. The watch’s appearance on Dexter has skyrocketed its recent popularity, and pieces that cost only about $30 back in the ’70s are now selling for hundreds of dollars. Dexter’s Waltham watch – simple and utilitarian. Dex investigates a crime scene he knows a little too much about already in the first season finale. Once his target is bound and awaiting justice, Dexter dons a protective layer over his brown shirt and cargo pants. The most immediate layer is an olive drab smock with long sleeves and a zip front. Despite his fastidiousness with each kill, Dexter usually doesn’t zip all the way up and the henley placket is left partially exposed. The smock is a simple garment with no visible pockets, and he protects the cuffs with his white latex gloves. Over the smock, Dexter wears a large black apron to insulate himself from the bulk of his “disposal”. The waterproof vinyl is treated to simulate a leather finish, and the inside is lined with cotton. A fixed vinyl strap is worn around his neck with extra long waist ties fastened in the back. The closest approximation of this apron would be Update International’s APV-2641HD bib. Dexter wears a pair of simple black rubber waterproof boots on his feet when in the kill room. Finally, when the task gets messy, Dexter lowers a clear hard plastic mask over his face. At its best, Dexter juxtaposed very dark comedy with the very dark nature and activities of its protagonist. Early on, the showrunners knew that taking itself too seriously would diverge the show into unintentional self-parody. After a stellar first season where Dexter’s primary antagonist emerges from his past and places his sister in danger, Dexter is finally able to realize that he’s not a total monster. The character development seen across the board in early seasons as Dexter interacts with Debra, his girlfriend/wife Rita, and their surrounding circle is the most genuine of the show. In the brilliant second season, Dexter’s nighttime activity is unmasked as a series of unidentified corpses begin appearing off the Miami coast. Naturally, no one begins to suspect this is Dexter’s handiwork, and the FBI sends in crack agent Frank Lundy (played by the increasingly charismatic Keith Carradine) to work with Miami-Metro PD. Lundy begins working with Debra, and the two develop a very genuine attraction as the case develops. Of course, with the dramatic irony kicks up the intensity with each episode as Debra comes closer and closer to unmasking her half-brother as Miami’s most notorious serial killer. In the season’s penultimate episode, “Left Turn Ahead”, Dexter imagines the possible outcomes of confessing to his sister in one of the most comic sequences the show has turned out. And again, the second season results in change for the characters while the show is still able to believably tie up loose ends. 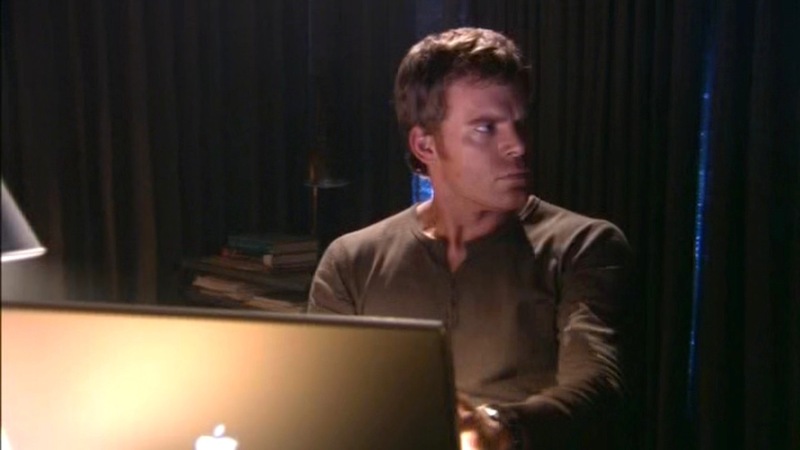 Dexter’s universe is also an appropriately branded one, with Dex himself showing plenty of brand loyalty to Apple. He uses the same 1st generation MacBook Pro with a 17″ screen throughout the duration of the show’s run, and he even adopts an iPhone in the sixth season. The iPhone is a welcome change after a few seasons of Dexter’s Nokia phones displaying text messages that resembled Jeopardy! clues – as Margaret Lyons of Entertainment Weekly observantly noted in this 2010 article. The show also uses, as Showtime shows are wont to do, a combination of real life liquors (often the result of product placement) and fictional spirits from places like ISS Graphics or Earl Hays Press. One particularly telling prop that was wisely chosen was a bottle of Jekyll Island Lager, a fictional label used by ISS that features a skull on a green label and recalls images of “Dr. Jekyll and Mr. Hyde”, the sinister doctor trying to repress the evil urges of his split personality. 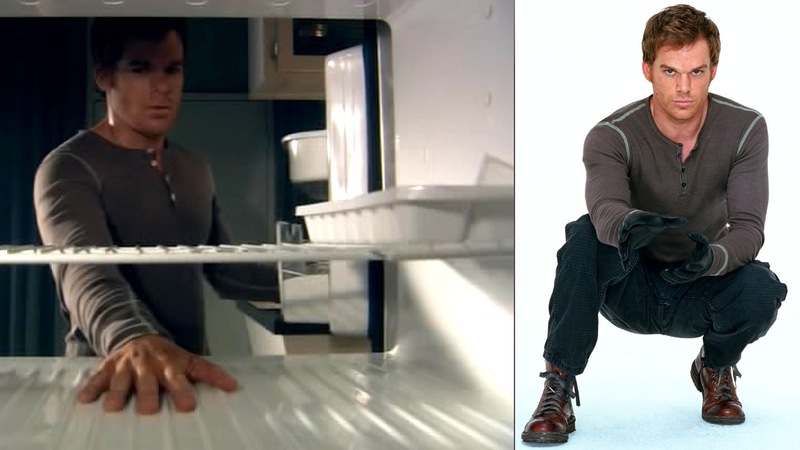 Although I typically eschew the use of fictional products, it’s very spot-on in the tenth episode, “Seeing Red”, for a scene where Dexter – a forensic scientist – and Brian Moser/Rudy Cooper/Ice Truck Killer – a prosthetic doctor – both find different ways of expressing or supressing their homicidal compulsions. Disclaimer: Don’t kill. Come on, guys. Unlike the Dexter from the novels, the series’ Dexter is more methodical in his killings with a determined MO that he only deviates from when necessary. After doing some investigation into the victim using either his police resources or his personal MacBook Pro laptop, Dexter confirms their guilt with irrefutable evidence. Dex surfs a few criminal databases. Note the brown buttons, indicating a scene from late in the first season. Once he knows when and where he will exact his justice, Dexter prepares his “kill site” in a place usually with some symbolic relevance to his target, totally draped with clear plastic tarp to catch all the spilled blood. Evidence is displayed of the target’s crimes, often via photographs of their victims. After donning his stalk outfit of brown henley and cargo pants, Dexter then trails his target and – when the moment is right – injects them from behind with an M99 tranquilizer (or etorphine hydrochloride, which he tongue-in-cheek-ly purchases using the alias “Patrick Bateman”). With the first “Code of Harry” criteria met – confirming the target’s guilt – Dexter next moves to complete the next by disposing of the evidence of his crime. Following dismemberment, Dexter wraps the corpses and the plastic tarps into biodegradable garbage bags with weighted rocks. He takes his boat, the cheekily titled Slice of Life out into the water and dumps the bodies off-shore. A simple look for a very complicated man. I won’t include the apron bib and the smock because… well, I hope you don’t need them for the same purpose as Dexter. 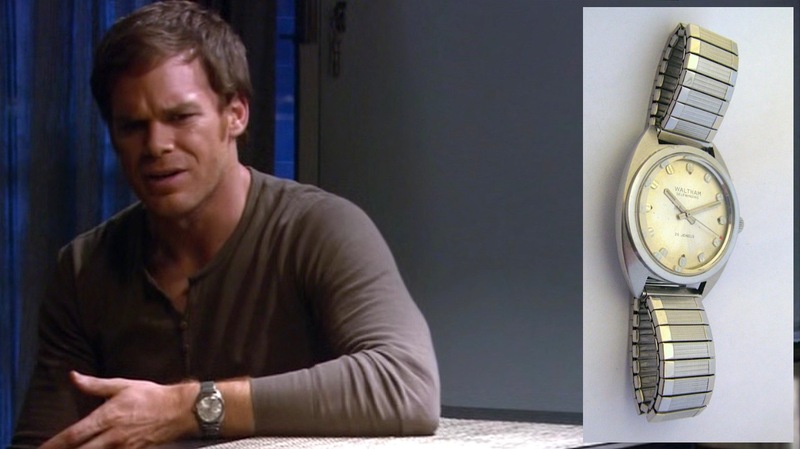 If you’re looking for Dexter’s watch and boots, Michael C. Hall reported in a Reddit AMA that those – as well as the laminate – are the only items from the show that he personally kept. Watch the show. If you’re looking for quality programming, stick to the first four or five seasons. If you’re looking to watch the entire series, then… have some laundry ready to do towards the end. I’m all for finishing shows, but it would be nice to be warned ahead of time to be disappointed that the best episodes, character development, and combinations of realistic narrative with strong story elements are behind me. Right now, my girlfriend and I own seasons one through five. I’m sure we’ll get the rest someday for the sake of completion, but I’m holding out hope that they’ll show up in a $5 bargain bin at Walmart soon. My code requires a higher standard of proof than your city’s laws, at zero cost to the taxpayer. If you ask me, I’m a bargain. Apologies if anything was left out. As I mentioned, I only have the first two seasons available for screencapping; I also own the fifth season, but my partial OCD – if that’s what it is – prevents me from capping the fifth before the third and fourth seasons. If there are major changes I missed, I’ll update this post later. 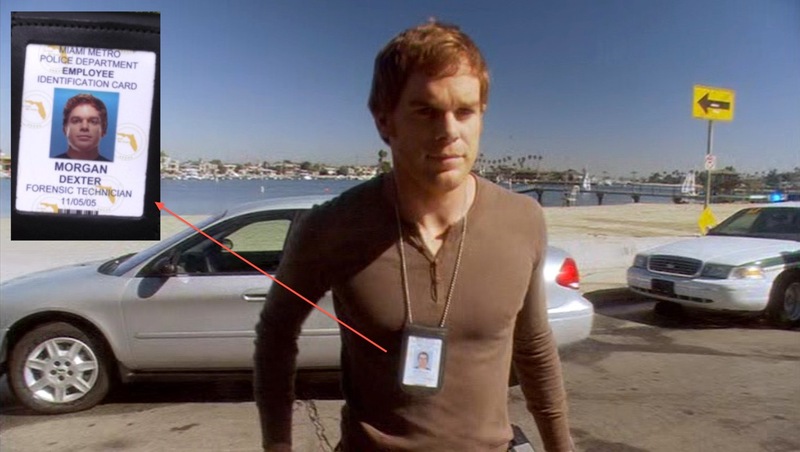 Since Dexter holds a civilian position with the police department he works for, he would not have been issued a badge, just the ID card that was correctly portrayed in the show. Unfortunately, garbage like the original CSI series, has people thinking that not only do civilian employees of law enforcement agencies carry badges, but they carry firearms and engage in shootouts, fist fights, and car chases. The rueful way Dexter answers “I have a laminate” when asked about his badge is a nice way for the show to lampshade this widespread misconception. The show ignores realism as the seasons go on, but it’s refreshing to see them hold mostly accurate regarding a civilian’s role in the department… even if “Miami Metro PD” is a force so incompetent it makes the Keystone Kops look like Serpico. Being a cop, sometimes watching how police and investigative functions are portrayed in films and tv can be irritating (CSI), to laugh out loud hilarious (The Shield). I don’t let that get in the way of my enjoyment of what I’m watching. One of my favorite guilty pleasure movies is Sylvester Stallone’s Cobra, which brings tears to my eyes with laughter when I see how police work is presented. Still an awesome movie, cool clothes, cool car, cool watch (Teeritz, you listening), and a couple of intersesting firearms. Back to Dexter, being a fan of cargo pants, I find it difficult to find a pair that fits. Generally, most that I have owned fit rather too loosely, which can look rather silly when wearing a proper fitting t shirt. However, the Lucky Brand ones do fit the best without the excessive baggy look. I think my shorter stature has something to do with it, but it’s hard for me to find a pair of cargo pants that don’t make me look too… horizontal? They get a bad rap, but I blame that on the IT types who load the pockets up with miscellania and hardly wash them. I’m thinking of looking into a nice military surplus pair, as I tend to like both the utilitarian and economical benefits of incorporating surplus gear into my wardrobe. If I could inexpensively find a pair of Lucky Brands like Dexter’s, though, that would do the trick as well. Although I refer to it in my Beverly Hills Cop article, I’ve never actually seen Cobra although many have told me that it’d be a fun way to pass a Saturday afternoon. Plus, I dig the custom-gripped 1911 that Stallone carries in it. Is that the same movie where he drives the classic Merc coupe? Great question. I have never really given it that much thought, but if I’m going to pick a show that best portrays police life, it would be…….Barney Miller from the 70’s and early 80’s. The best film would be Electra Glide In Blue, also from the 70’s. The Choirboys was pretty good as well. It’s good to see things from time to time in films (proper use of 10 codes being one example) that are correct, but I certainly don’t expect it when I watch shows and movies that have cops in them. You are correct, Stallone does drive a 1950 Merc in Cobra. Check it out if you can, everything about the film is so gloriously over the top it’s easy to forgive it’s flaws. Cargo pants are usually a staple of Lucky Brand’s clothing line, so with the right amount of searching, one can usually find them on their clearance racks. Mr. Richards, I too have never seen “Cobra”. It came along at a time when Stallone had a lot of traction thanks to “Rambo”. Although, from watching the trailer a few times when it was released, I managed to do a pretty convincing “You know you got an attitude problem?/ Yeah, but it’s just a little one” impersonation after a while. Looks like Stallone wore a TAG Heuer in that film. Huge brand in the late ’80s. As a LEO, it must drive you nuts seeing the liberties that they take with how cops are portrayed on film. I feel the same whenever I see a scene with a snooty, smartassy waiter making snide remarks to customers. I know it’s not in the same league as cops, but after working in hospitality for 22 years before retail, I find that most screenwriters have forgotten what it was like to wait on tables. If I had spoken to customers the way waiters do in the movies, I’d have had to turn in my gun and badge (corkscrew and apron) on-the-spot and then apologise to the customer before the restaurant manager escorted me out of the place. Cargo pants are tricky. For me, a good fit in the leg usually means a slightly too snug fit in the waist. It is a Heuer, but as usual for Stallone, it may have been a limited edition watch. It has what appears to be a grey leather strap, gey face, and grey bezel. Growing up in the 70’s and early 80’s, my brother and I considered Heuers the pinnacle of watches. I can remember in 1985, when my brother left for the Air Force, the last item he purchased was a Heuer dive watch. I was sporting an early 80’s Timex “waterproof” dive watch at the time, so my envy was high. When watching police themed movies and tv shows, I almost have no expectations as to them resembling anything close to reality, so it doesn’t bother me too much. There are a few examples that have grated on me, like the previously mentioned CSI, but the one I found actually offensive was the Insomnia remake with Al Pacino. There is just something about that movie that annoys the hell out of me, yet I love a movie like Cobra, go figure. You’re right, Craig, it was a Heuer. Stallone’s Cobra watch was made just prior to TAG’s merge with Heuer. It was part of the 2000 Series, which was meant to be a more fashiony version of the only-available-in-black 1000 Series dive watches, and were available with both grey and dark blue dials and bezels. Definitely fewer of them out there in the world.